Create long-lasting outdoor signage with the fastest printer in its class. This 64 in/1626 mm HP Designjet is an excellent tool to boost production and profitability: increase your print volume, improve your services, and reduce your costs. • Heavy-duty HP printheads and HP supplies for maximum productivity Experience high-speed printing with six heavy-duty Piezo printheads that come with 512 nozzles per printhead for a total of 3,072 nozzles. 1000 ml, HP 790 ink cartridges are designed to meet your usage needs. • Enable long, unattended print runs for improved productivity with the HP Take-Up Reel Busy print and sign shop employees can be more productive by maximizing unattended printing with four winding modes: slack/face-in, slack/face-out, tight/face-in, and tight/face-out. • HP Smart printing technology(2 makes HP "low-solvent"(3 printing supplies easy to use and manage Interactive system technology in HP ink cartridges, printheads, and your printer optimizes print quality and reliability and monitors ink levels. • Dry signs quickly and safely with the easy-to-operate HP Designjet High Speed Dryer Add this optional high-speed dryer and accelerate drying time. Control temperature, fan airflow, and the timer from the front panel. Combine the dryer with the automatic Take-Up Reel Kit and enable long, unattended print runs at maximum print speeds. .
• Wow your clients with vivid color output that shines brightly Create signs, banners, and large graphics with such vivid color, they radiate success. Sophisticated HP low-solvent ink formulations and printhead technology enable a higher concentration of colorants in the inks to produce a wider gamut of rich, saturated color. The result - more vivid color for high impact image quality. • HP low-solvent inks - excellent durability without lamination on low-cost, uncoated media Designed with the HP 9000s Printer, HP low-solvent ink formulations produce durable prints that resist fading for three years without lamination and are scratch, smear, and crack resistant (4. 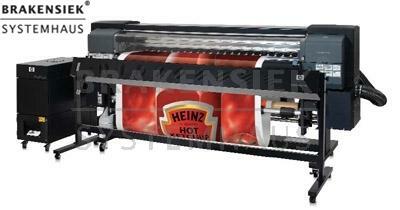 • Premium image quality - HP printing materials designed with HP low-solvent inks With HP Premium Scrim Banner, HP Universal Scrim Banner, and HP remium Backlit Film, get premium image quality and high opacity. • Successfully compete against screen print shops for those shorter run lengths Yes; it's true! Better business and more profits are a reality with this printer. High print speeds and low printing costs increase the break-even point against screen printers, making it easier to compete, and creating a huge opportunity in the outdoor printing market. • Minimize your costs and get lasting output on uncoated media Count on excellent quality output on a range of low cost, uncoated materials, such as adhesive vinyls, films, banner stocks, papers, and fabrics. • Have a clean, safe print environment with an integrated air purifier created for HP Designjets This printer-connected system uses a sealed, carbon-activated filter and high-powered fan to filter air at a rate consistent with the print speed and the number of volatile organic compounds released during the printing process. • HP guidelines help make HP low-solvent ink printing safe, productive, and easy Following HP's installation and use guidelines helps you achieve a reliable and productive low-solvent ink printing solution and helps you address environmental, health, and safety questions about printing with HP lowsolvent inks. • Designed together for HP quality and reliability The HP Designjet printing system - printers, low-solvent inks, ink cartridges, printheads, and printing material - is engineered to work with precision and must meet strict HP quality standards. Reliable operation saves you time and improves your productivity.